“Thursday Night Football” got chippy this week. After Ravens quarterback Joe Flacco was knocked out of the game on a late hit, tensions were high. 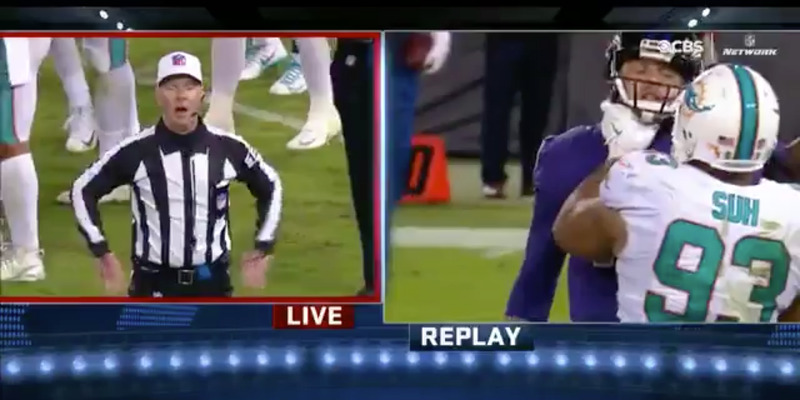 In the fourth quarter, Ndamukong Suh grabbed backup quarterback Ryan Mallet by the throat in the middle of an altercation. After an impressive run of entertaining games on Thursday nights, football fans did not expect much from last night’s matchup between the Miami Dolphins and Baltimore Ravens. From a football standpoint, they were proven correct, with the Ravens running away with the game and winning 40-0. But while the game was a blowout tensions were still high. In the first half, Kiko Alonso hit Joe Flacco as the quarterback was sliding and knocked him out of the game. Then, in the fourth quarter and with the Ravens working with an insurmountable lead, Ndamukong Suh jumped offside and shoved Baltimore backup quarterback Ryan Mallet to the ground. When Mallet responded by getting in Suh’s face, Suh grabbed him by the throat and shoved him again. Suh was assessed a personal foul on the play, and due to his reputation as a dirty player, there’s a good chance he’ll get fined or even suspended for the play. It wasn’t the only cheap shot that occurred on the play. Dolphins defensive end William Hayes was flagged after he poked opposing offensive lineman Austin Howard in the eye during the scuffle. After the game, Suh was asked why he got so aggressive with the opposing quarterback, and argued that the entire debacle was a matter of self-defence.